Robert DeNiro has confirmed that The Irishman will also star Joe Pesci and Al Pacino. 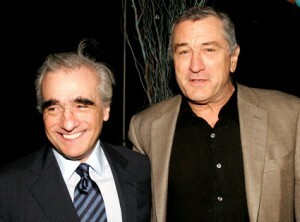 Martin Scorcese has been working on the project along side DeNiro for a couple of years now. Harvey Keitel is rumored to be joining the cast as well. Sounds like a perfect ensemble for this type of film. The Irishman is based upon the novel I Heard You Paint Houses. It is a true story about Frank “The Irishman” Sheeran who claimed that he killed Jimmy Hoffa in 1975. Sheeran also claimed to have knowledge of the Kennedy assassination. He was also the man who pulled the trigger in the death of mob legend Joe Gallo. This will be the first time that Pacino will be working with Scorcese which is rather surprising. It’s hard not to be intrigued about anything Scorcese has his hand in. It is uncertain when this film will start filming. Scorcese is currently filming Hugo Cabret and then has Sinatra next on his plate. Check back here for more details as they become available. Who is your favorite actor in this potential cast? Let us know in the comments below.